The word "city" began to take on two meanings in New Zealand after the local government reforms of 1989. Before the reforms, a borough council with more than 20,000 people could be proclaimed a city. The boundaries of councils tended to follow the edge of the built-up area, so there was little difference between the urban area and the local government area. In 1989, the structure of the local government in New Zealand was significantly reorganised. The new district councils and city councils were nearly always much larger geographically, and they covered both urban land and the surrounding rural land. Many locations that once had had a "city council" are now governed by a "district council". 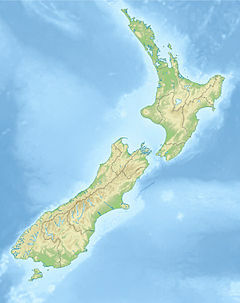 The word "city" is used in a general sense to describe the urban areas of New Zealand, independent of local body boundaries. This informal usage is jealously guarded. 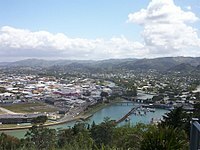 The district government of the town of Gisborne, for example, adamantly described itself as the first "city" in the world to see the new millennium. 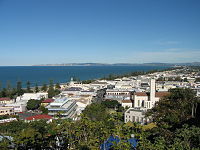 However, Gisborne is governed by a "district council", though its status as a city is not generally disputed in New Zealand. Similarly, there is no "city council" in Auckland, though its status as a city is not generally disputed due to its size. Today an urban area has to be at least 50,000 residents before it can be proclaimed as a city. The populations given in the table below are provisional New Zealand resident populations, June 2018, and they refer to the entire urban area, unless otherwise stated. 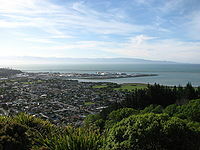 Kapiti Urban Area (42,700) is the only Statistics New Zealand main urban area not listed. It spans the towns of Otaki, Paekakariki, Paraparaumu, Raumati and Waikanae, and is not considered to be a city. It is part of the Greater Wellington Regional Council's area – though listed separately by Statistics New Zealand. Hundreds of people there commute daily to Wellington for work, and the suburban commuter rail network serves the Kapiti area. If Kapiti were added to Wellington the total population of the Wellington urban area would be approximately 450,000. The population for the Hamilton urban zone is 203,100, the Cambridge urban zone is 20,600 and the Te Awamutu urban zone is 17,500. The population for the Hastings urban zone is 70,600 and for the Napier urban zone is 63,900. Still widely referred to by its older spelling of Wanganui. Blenheim (31,600) is rarely referred to as a city. 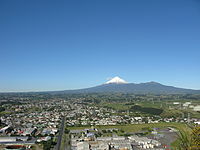 Pukekohe, a town in the south of the Auckland Region, has an estimated population of 31,400. Timaru (29,100) once had a city council, but is now administered by a district council. It is classified as a secondary urban area by Statistics New Zealand. It is still considered a city and the principal centre of South Canterbury. Road signs state "city centre" rather than "town centre". Taupo (24,700) is rarely referred to as a city. Masterton (22,200), the main centre in the Wairarapa, is rarely referred to as a city. Levin (21,200), the main centre in the Horowhenua district, is not considered to be a city. Tokoroa was long expected to become a city when its population continued to grow past 18,000 during the 1980s. However, with the fallback in the forestry industry, Tokoroa's main industry, many jobs were lost and Tokoroa's population declined. It now has 14,050 residents. The populations given are the latest (June 2018) Statistics New Zealand estimated resident populations. 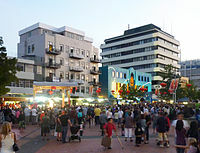 Many cities were reorganised into districts by the Local Government Commission in 1989 under the Local Government Act 1974, for example Timaru. Other urban areas that are no longer cities, such as Rotorua and Whangarei, have higher populations than some present cities. The most recently proclaimed city is Tauranga, which became a city, for the second time, from 1 March 2004. 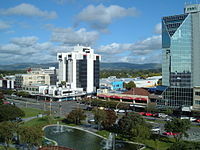 Christchurch (1862 and 1868) and Invercargill (1930 and 1991) have also been declared cities more than once. Under Section 27 of the Local Government Act 2002, a district may become a city by either a "reorganisation scheme" with the Local Government Commission, or under Section 27(1) it may apply for a change in status under Schedule 3, Clause 7. The new city must have "a population of not less than 50,000 persons", be "predominantly urban" and "a distinct entity and a major centre of activity within the region" (or regions) that it is encompassed by. Existing cities are grandfathered under Schedule 2, Part 2 of the Act. The only new city council so far under this section is the Tauranga City Council, from 1 March 2004. Previously, under Section 37L of the Local Government Act 1974, new cities could only be formed from a "reorganisation scheme". The same criteria were used. The last city to be constituted under this section was Invercargill, which was re-reorganised into a city in 1991. In 1991 the Lower Hutt City Council became the Hutt City Council by a special Act of Parliament  that which did not change the name  of the city of Lower Hutt; the city's coat of arms still refers to the "City of Lower Hutt". During provincialism in New Zealand, from 1852 until abolition in 1876, there was no uniform system of local authorities in New Zealand. There is thus some argument over which of the following cities was the first. The Municipal Corporations Act 1876 included the first schedule of cities, with the dates they were constituted. Dunedin was the first city in New Zealand to be described in an Act of Parliament as 'City of...', something now automatic under the Local Government Act 2002. Up to October 1989, the Local Government Commission under took reorganisations of local government. As a result, some cities were reorganised into other larger cities or changed to districts, and some of these areas are still considered cities by many New Zealanders. This is a list as at circa 1986. ^ "Local Government Act 2002, Schedule 3 part 16, Cities". New Zealand Government. Retrieved 28 November 2016.